Wonderful experience. Thoughtful and prompt responses from everyone at Resortica. Nothing was lacking. My travel agent did all the contact . What questions I did have were answered promptly. Team was very polite, accommodating, professional and pleasant. NO complaints from us! Truly enjoyed staying in the unit. It was well equipped, clean, and large enough for a party of 6 adults. Complex amenities were excellent and location of complex was awesome. The team was great when we needed assistance with anything from the booking and questions we had about the property to during our stay and after our stay. Very pleasant to work with! The property was clean, just what we wanted and beautiful, the grounds very kept up, we loved the pool and we will be back again! We had a wonderful time and the house was perfect for our family. It gave us plenty of space and provided all the necessities for a great vacation. The Beach Club is the perfect spot with a fine restaurant/bar footsteps away. We would definitely do this again! I only had communication online, but always had quick and efficient responses. 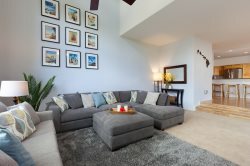 We have stayed at the Waikoloa Beach Villas many times and have always enjoyed our stays. The condos are beautiful, the entire property is very well maintained, and the location is great. Also really enjoy playing the two golf courses.